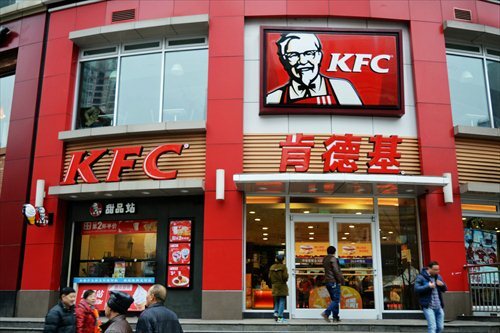 Yum Brands, parent company of US popular fast-food chain KFC, is in talks with private equity (P/E) groups including KKR & Co LP to sell a 19.9 percent stake in its China unit, the Financial Times reported on Thursday, citing unidentified sources. The newspaper quoted people familiar with the matter as saying that the talks, which have attracted several Chinese funds, were at an early stage and may not lead to a deal. Those people valued Yum's China operations at about $10 billion. Hopu Investments, co-founded by former Goldman Sachs banker Fang Fenglei, was said to be one of the Chinese funds interested in the stake. Neither Hopu nor KKR could be reached for comment as of press time. In response to the Global Times' inquiry about the report, Yum declined to comment but reiterated its plan to separate Yum and its China unit into two "powerful, independent, focused growth companies." The company said in a statement sent to the Global Times on Thursday that it will provide updates on the plan at appropriate times, "and we won't comment on rumors or speculation." The plan, which was announced in late October 2015, is expected to spin off approximately 6,900 restaurants in China, which reportedly account for about half of Yum's total sales. Yum seems intent on avoiding a big tax bill in the upcoming spinoff by selling stakes, said the Wall Street Journal, which initially reported the deal. Analysts disagreed with that assessment. "The stake sales can bring new investors to Yum's China unit, which will raise its market valuation ahead of the IPO," Yan Qiang, a partner with Beijing Hejun Consulting, told the Global Times Thursday. Upon the completion of the split, scheduled to occur by the end of 2016, Yum's China operations will get listed separately, under the lead of its current CEO Micky Pant, a press release on the website of Yum showed. According to media reports, the listing might be on the New York Stock Exchange, or possibly in Hong Kong. Yan also noted that another reason for Yum to sell a stake may be to raise money for further expansion in China, showing the US company's confidence in one of the world's largest economies. 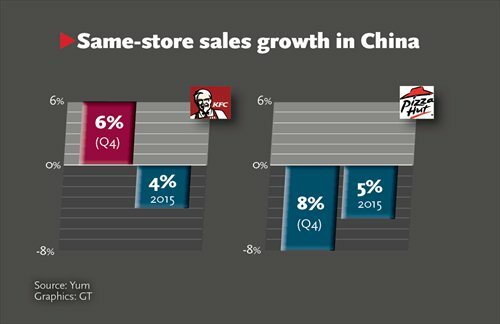 Same-store sales of KFC operations in China grew 6 percent year-on-year in the last quarter of 2015, faster than the growth of 1 percent in the US, KFC's largest market, according to the latest quarterly report issued in February. The growth signals a recovery from food safety scandals in recent years. For the full year of 2015, Yum's overall same-store sales in China dipped 4 percent from a year earlier, although that was less than the 5 percent drop in 2014. In the fourth quarter, the same-store sales of Yum's China division grew 2 percent year-on-year. Yum opened 743 new restaurants in China in 2015, including 351 under the brand KFC and 280 Pizza Hut Casual Dining outlets, exceeding the 700 target the company previously set. Yum still needs time to repair its reputation in the Chinese market as its sales growth declined in 2015, said Yan. "But its performance in China will get better soon, as Yum has started to further its presence in second- and third-tier cities," he noted. In early March, Yum opened the first KFC store in Lhasa, capital of Southwest China's Tibet Autonomous Region, which reportedly got a very warm reception. Chen Yuefeng, editor-in-chief of the China Chain Store magazine, thinks that Yum doesn't seem to be as optimistic as Yan about the China operations. The spinoff may be intended to make sure that Yum's businesses in other markets won't be dragged down by a possible unsatisfactory performance in China again, taking a warning from previous setbacks in the Chinese market, Chen told the Global Times Thursday. China's new emerging middle-class consumers in big cities have started flowing into local fast-food chains, which offer more localized and healthier foods, signifying big threats to Western fast-food restaurants like KFC and McDonald's, said analysts. "Maybe Yum wants to gradually withdraw from China following the spinoff," said Chen.